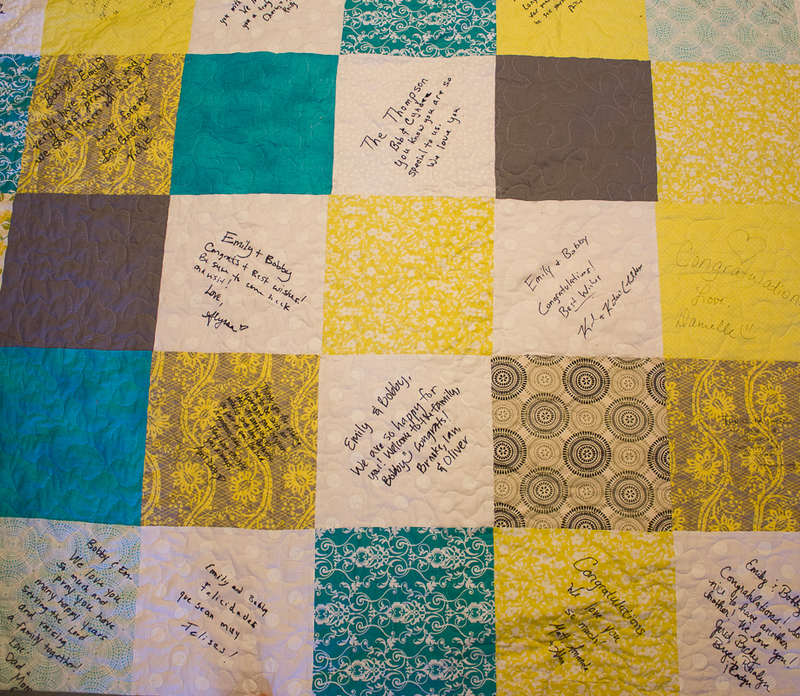 How to Make a Guest Book Wedding Quilt: Part 3 and Finished! First of all, the giveway continues on through tomorrow night so head over and leave a comment if you haven’t yet to get your name in the hat. I’ve really enjoyed all the comments and new followers I have met this week! Because this turned out so big (King Size!) I spray basted the quilt and then just did an all-over stipple on my sewing machine. Oh I wish you could see the happy dance that I am doing right now! I am so very, very happy to have this quilt finished. Part of me thought I could never get it done, but I was wrong- due in main part to the amazingness of my new Bernina. I never could have quilted this thing on my old Singer. 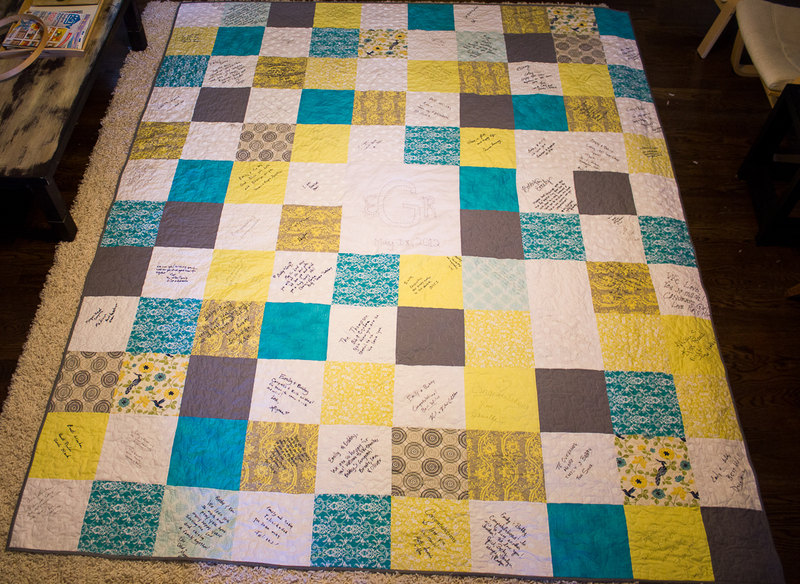 I have had the backing and top finished for a while and have been putting off quilting it because I was not sure how I was going to get the king-size quilt through a regular sewing machine. I am not going to say it was the easiest thing in the world but it was possible. I have a list of projects that need to be completed before baby comes and this was number one on the list so I just determined that this week would be the week that I finished it. Monday, I spray basted the quilt (quite a job with a quilt this big!) and then added a few pins to give a little additional support. I spent Tuesday and Wednesday quilting both during nap time and at night. I think it took me a total of about 5 hours to machine quilt. I decided to stipple the quilt because I liked how it turned out on the last quilt I did, and, for me, it’s a lot faster than any other method. I’m not gonna lie- those middle sections of the quilt were tough! All that extra material bunched up in the harp space was a bit of a pain. However, all things considered, it was easier than I had anticipated it being. Then I did some hand quilting in the very middle of the quilt with the initials of the married couple and their wedding date. (Yeah notice how it’s almost exactly a year ago…lol). Today it was binding time. I was way too tired at this point to even think about making 12 yards of bias tape myself. Thankfully, my local Hobby Lobby had exactly the amount I needed in a gray color almost perfectly matching the Kona gray in the quilt. I also decided to machine stitch the binding on for time and energy reasons. I used my walking foot for the first time and really like how it keeps the bias tape nice and even! And now the grand ta-da…all finished at last! I really like how the finished project turned out. The stipple quilting is the perfect accent without taking away from the signatures. I would totally recommend doing this for a great wedding keepsake- just do better math that I did and don’t make it quite so large (It is almost exactly the size of my 8×10 rug!)! Sorry for the lack of amazing pictures. 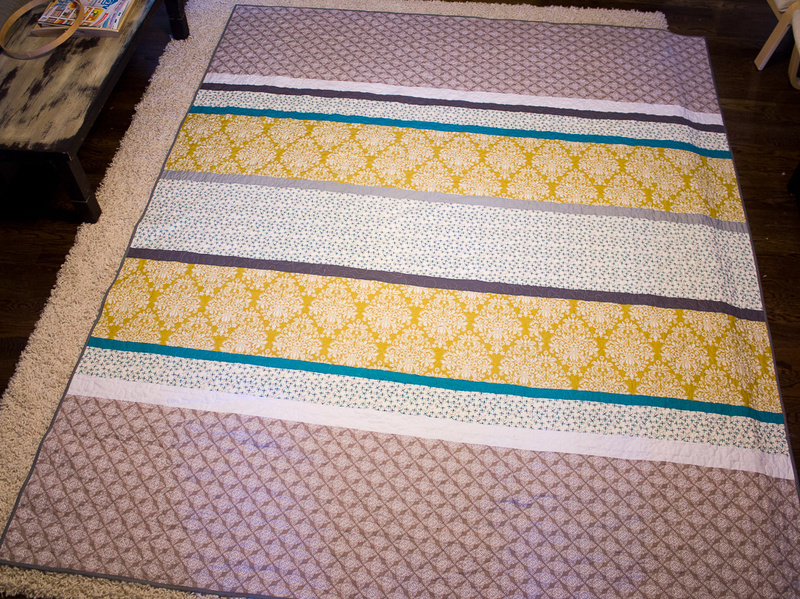 If someone has any great ideas of how to photograph a king size quilt feel free to pass that info on to me! Plus I am just too exhausted at this point to attempt a cool photoshoot. If you need me this weekend, I will most likely have my 36 week preggers body on the couch recovering from my quilting marathon! 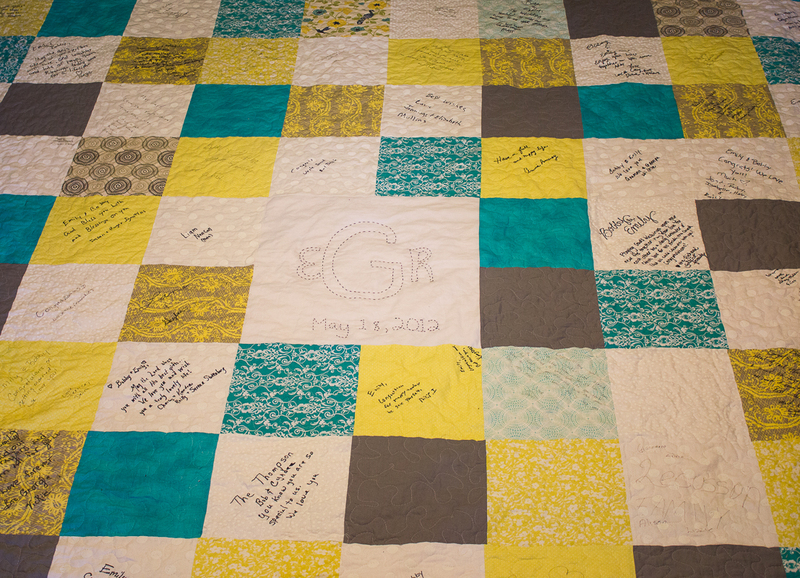 This entry was posted in Gifts, Quilts and tagged guestbook quilt, patchwork quilt, wedding guestbook quilt by oliver's fancy. Bookmark the permalink.